The First Khilafah Conference Held in Ash-Sham the Abode of Islam! 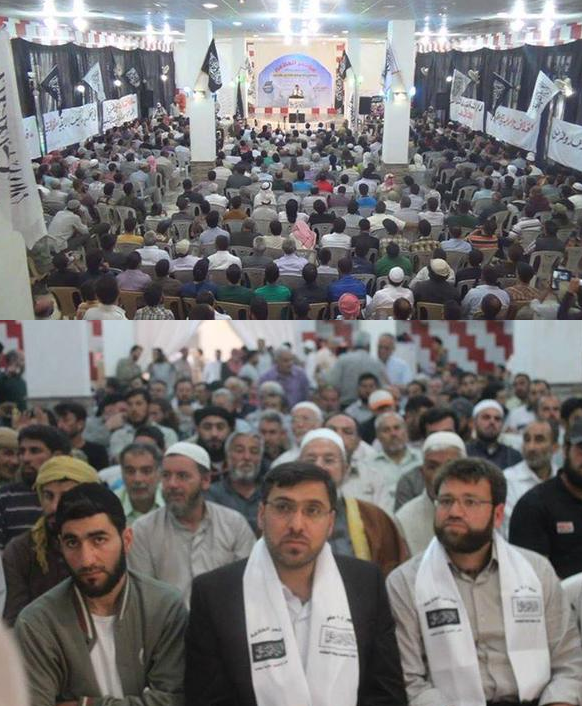 Hizb ut-Tahrir/ Wilayah Syria organized the first conference on the 94th anniversary of the destruction of the Khilafah under the title: “The Revolution of Ash-Sham is the Ummah’s Revolution towards the Establishment of the Khilafah” that took place in the northern countryside of Idlib, on Saturday 23/05/2015. This conference comes to confirm to the whole world the steadfastness of the people of Ash-Sham in their demand to establish the rightly guided Khilafah, and their rejection of the civil state project, which is promoted by the Kafir West, and stand in the way of all those tempted to make concessions, in the beginning of selling of the revolution to its enemies. The conference saw a significant presence in spite of all the difficulties and dangers that surround the land of Ash-Sham in general. During the course of the conference, speeches were delivered by Hizb personalities and some scholars from Ash-Sham. The participants confirmed the need of the revolution for a clear political project that the Ummah and people of power in it adopts, until this force is embraced by the People, thus constituting a strong barrier in the face of the West and its plans and establishes the rule of Allah on earth. The participants also stressed the magnitude of the catastrophe that befell the Muslims since their state fell, as they also stressed the obligation to work for its restoration. In a speech entitled: “Ash-Sham’s Revolution between the Civil State and the Islamic Khilafah”, the speaker outlined the civil state project posed by the Kaffir West and exposed those who have embraced it, like the coalition and others, and stated that the people of Ash-Sham will only accept the Khilafah project as an alternative. During the course of the conference program, there were several activities, events, and segments of poetry reading; in which participants read out poems inspired by Ash-Sham’s revolution. There were addresses with messages to the conference by: Br. Sharif Zayed, Head of the Media Office of Hizb ut-Tahrir / Wilayah Egypt and Br. Abdullah Ali Al-Qadi, Member of the Media Office of Hizb ut-Tahrir / Wilayah Yemen, and Dr. Maher Al-Ja’bari and Dr. Musab Abu ‘Arqoob, Members of the Media Office of Hizb ut-Tahrir in the Blessed Land of Palestine. Messages were also read from Afghanistan and Tunisia. Today as we witness the first Khilafah Conference taking place in the blessed land of Ash-Sham, our eyes yearn for giving the pledge of allegiance to the Khaleefah of the Muslims in the Umayyad Mosque in Damascus; this matter is easily achievable by Allah (swt).